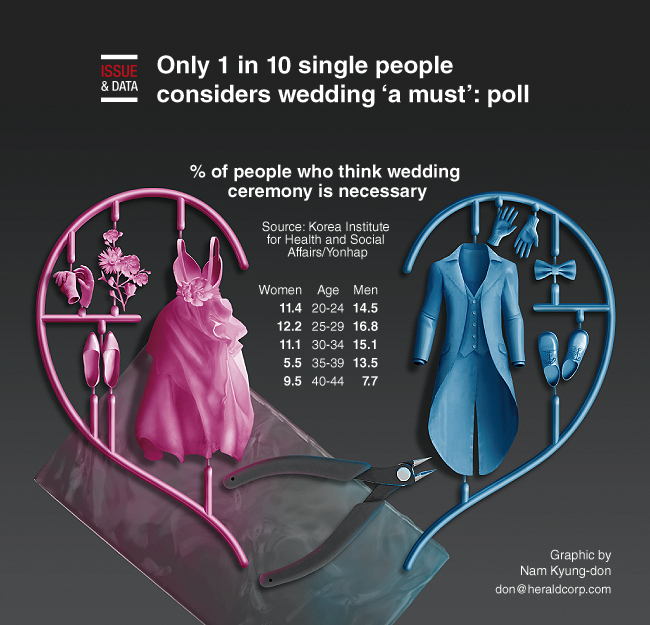 Only 1 in 10 single people in South Korea believes a wedding is essential for a married couple, a survey said. According to the poll of 2,464 unmarried people -- 1,140 men and 1,324 women aged between 20 and 44 -- carried out by the state-run Korea Institute for Health and Social Affairs, only 10.8 percent of female respondents said they believed a wedding ceremony was essential. Another 34.4 percent of women said they “generally” wanted weddings, according to the poll conducted by the institute last year for an annual report on family and social welfare policies.